Club Penguin for iPad, iPhone, and iPod Touch is GETTING A HUGE UPDATES IN THE APP STORE! Club Penguin for the iPhone, iPad and iPhone Touch is now getting a complete re update! It is going to be great and we have many awesome things to do with these apps that is going to be out of this world! We are going through a new plan in the Club Penguin Apps that includes: More Apps, More News, More Everything Club Penguin related to iPhone Apps and iPad too! We are still #1 with over 120,000 DOWNLOADS in less than 2 MONTHS! WE ARE SO PROUD! THANK YOU FOR MAKING CLUB PENGUIN APP FOR iPad, iPhone and iPod Touch a DREAM COME TRUE! Club Penguin Apps for iPod Touch, iPhone, and iPad MORE UPDATES! STILL NUMBER 1 IN THE WORLD! DOWNLOAD CLUB PENGUIN APP FOR IPOD TOUCH, IPHONE, AND IPAD NOW FOR FREE! Club Penguin Cheats App for the iPod Touch, iPhone and iPad NOW #1! Club Penguin for the iPod Touch, iPhone and the iPad is now in the App Store and is OFFICIALLY the OVERALL #1 Club Penguin App in the App Store! No one does iPod Touch, iPhone and iPad Club Penguin Apps better than we do! We were the first, and we are still rocking it! There is MUCH MORE to come for the apps! So don’t go anywhere because this is JUST the beginning for our plans to have Club Penguin Cheats App be the #1 Club Penguin iPod Touch, iPhone and iPad application in the World! Here is the list of things that we have currently overcome! For more information on how Club Penguin Cheats App for the iPhone, iPod Touch, and iPad is doing, check out the link below! Club Penguin Apps: You guys choose! We are releasing a new update to the Club Penguin Cheats App in the App Store! It is almost ready for review and we would like to know what do you LOVE the most about the Club Penguin Cheats App?! We are working on new stuff for Club Penguin Apps and other stuff! So I hope you are excited because I know that we are! Till then, see you next time! Club Penguin App for iPod Touch, iPhone and iPad! There have been many club penguin applications going in and coming out of the App Store but for the first time EVER, there is a FREE one! And it is pretty cool I have to say! Unlike all other club penguin apps in the store, this app gets updated at least once a month! And is flooded with almost 100 different cheats! 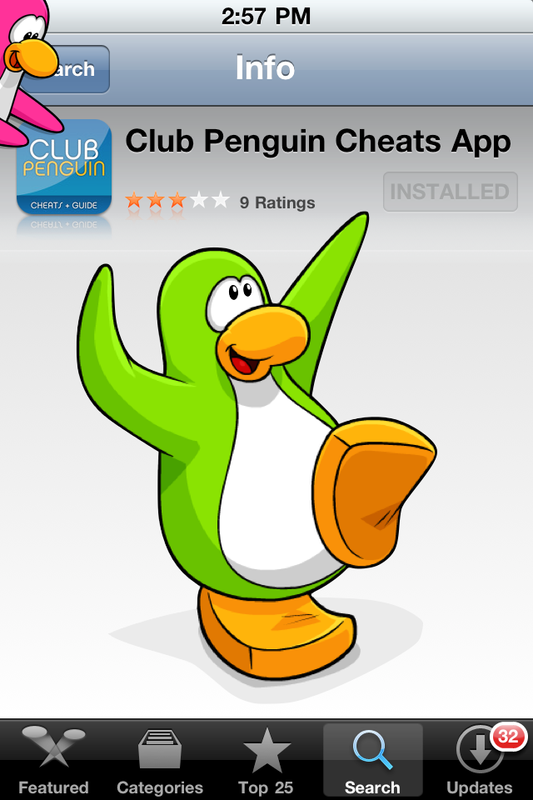 To download the app on your ipod touch, iphone, or ipad, just go on your device or computer and search “Club Penguin Cheats App”! It’s that simple! OR YOU CAN JUST CLICK ON THIS LINK RIGHT HERE AND DOWNLOAD IT NOW! When you search just click on the top one, which is FREE! and you can be on your way with a club penguin cheats app with any worry of having to pay! LOL! I already downloaded it! It is getting many downloads everyday and I suggest you download it now because we don’t know how long it will remain free! They are I think the best club penguin application creators in the world! They were the first ones to make them in the first place. Why wouldn’t they be the best?! To follow the creator of this application and more, go on twitter and follow him @Gwami and you will be glad you did it! He’s great!